*Although the Academy requires U-14 and below to train a minimum of three days a week, it is strongly recommended that players train a minimum of 4 days per week with their club. Development Academy fees can be broken into two categories: what the Academy provides, and what costs the clubs are responsible to cover. Player dues and expenses vary by club, and we recommend players contact clubs directly for further information. The Scholarship Program is supported by the U.S. Soccer Federation to help Academy clubs and players move away from the pay-to-play model of soccer. For more information on deadlines, the application process, eligibility and program requirements click here. 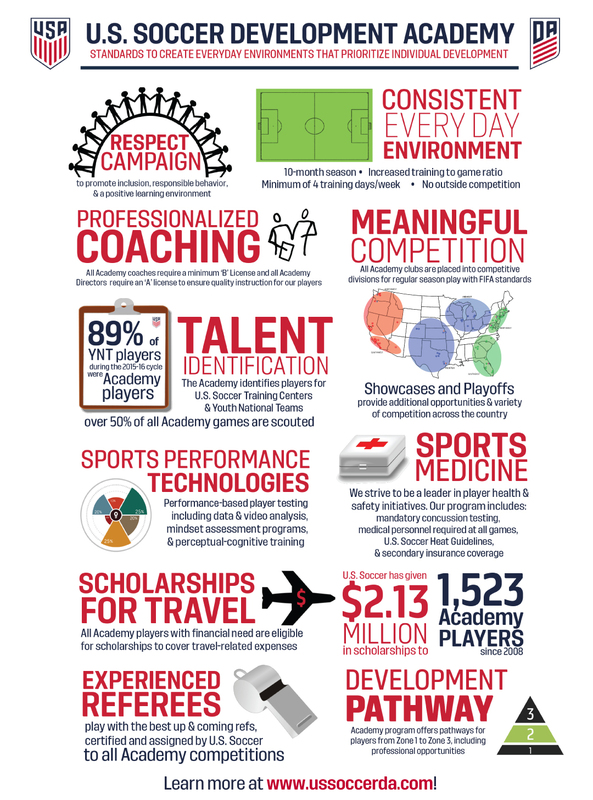 Development Academy Annual Performance Bond: a one-time deposit of $2,500 per club due upon entry into the Academy. This bond will be returned to the club if the club chooses to leave the Academy. If the club is dismissed from the Academy for whatever reason, this bond will be withheld. Clubs are responsible for all other expenses, including travel for competition, facility costs, etc.